See how you'll always make more money each month with a job! 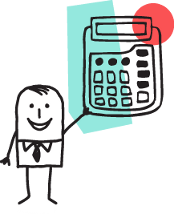 So easy to use: Just enter your Wage Statement amount and your current SSI amount, then click "Calculate" below—the calculator will do the rest! If you don't have a job now, use a Wage Statement (gross amount) that you think you could earn. For example, you could enter $600 for your Wage Statement. Enter your Wage StatementThis is a breakdown of your earnings from a job during a specific pay period. It contains information such as gross wages, net pay (also called "take-home pay"), work hours, year-to-date earnings and deductions. New York State requires businesses to supply statements each time they pay employees.Wage Statement (gross amount) for the month. Subtract the Earned Income Exclusion. Subtract the General Income Exclusion. Check this box if you are 22 years of age or younger, regularly attend school, and earn less than $7,180.00 per year from your job. This is your Total Countable Earned Income. Enter your current Supplemental Security Income (SSI)The money you receive each month through the SSI program, which makes cash-assistance payments to aged, blind and / or disabled people, including children, who have limited income and resources. SSI amount. Wow! With the Wage Statement you entered, along with SSI benefits, you’ll make an extra $ each month! IMPORTANT: To make sure your results are correct, contact an SSI Benefits Navigator.